Renowned for being the town with the ‘smallest bank’ Shackleton is situated on the Quairading – Bruce Rock road between those two towns. The Bank is a three by four metre weatherboard building used as a Bank Agency until 1997. It started life as an Infant Health Centre in Bruce Rock and was moved to the town in the 1930’s for use by the Agricultural Bank. A rest area with picnic tables is available in the town. 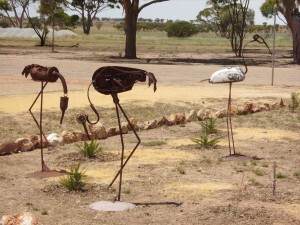 Paintings, Garden Art and Sculptures created by local artist, Steven Van den Ende can be viewed while visiting this studio and sculpture park which is surrounded by newly established gardens. Tea shop with homemade delights and sitting areas spread throughout the sculpture park. Address: Cnr ofJermyn and Parry Streets, Shackleton (The big red shed).